This really seems like Bibi’s last chance to do Teshuva. It’s elections tomorrow. It’s also David Feiglin’s wedding tomorrow. Moshe wants to go up to Har Habayit with his son before he gets married. I dare say that if Netanyahu allows Moshe to go up, he will win the elections. If he refuses, he will lose badly. This is his very last chance to do something good. There won’t be another. I have a feeling that God will not allow another. With the grace of God, my son will be married tomorrow. That is, my son David who as you know was involved in a terrible car accident. I have no words to describe how full my heart is with excitement and gratitude for this miracle we have been privileged to see, my son David going from the very brink of death to building a Jewish family. Our disagreement regarding your policies surrounding the Temple Mount and its consequences for Jewish sovereignty in Jerusalem is well known. 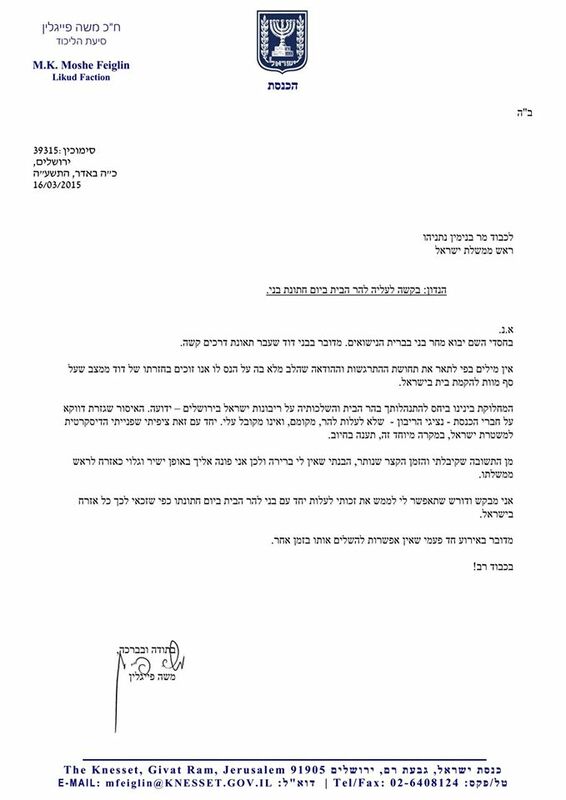 The executive decree you declared forbidding entrance specifically to all Knesset Members – the representatives of Jewish sovereignty – is outrageous and unacceptable to me. Nevertheless, I believed my discreet request to the police in this matter would be granted. From the answer I received and the little time that remains, I came to the conclusion that I have no choice and therefore I am turning to you directly and publicly as a simple citizen to his Prime Minister. I request and demand that you allow me to exercise my right to go up to the Temple Mount with my son on his wedding day, just as every other Israeli citizen has the right to do. This is a once-in-a-lifetime event that I will not be able to make up for at some other time. This is an epic watershed moment among the many that are happening right now in the world. We’re about to turn a corner, one way or the other. Huh? Why can’t people go there? What’s the deal? This is what I call a deal breaker – building a basin from Shekina’s well. We don’t find this agreeable. God is God, government is government, nation is nation, religion is religion. Here are four entities that people still can’t see as independent. Why? And I am one who saw the original Michelangelo “Pieta” statue, with the hit in the face, and I shrugged – if people want to destroy a statue they want to destroy a statue, it doesn’t mean anything else. What’s the gov. doing with Temple Mount? Preserving it? From what? Winds blows, stone turns to sand. One day they will build a glass cube around it and that will be a HUGE problem. Temples are FOR people, for human beings. They are not for anyone else – institution, art, conceptual ideas, leaders, priests, science and divination. They’re not even for God. God is powerful, people are small and frail, they need the temples.